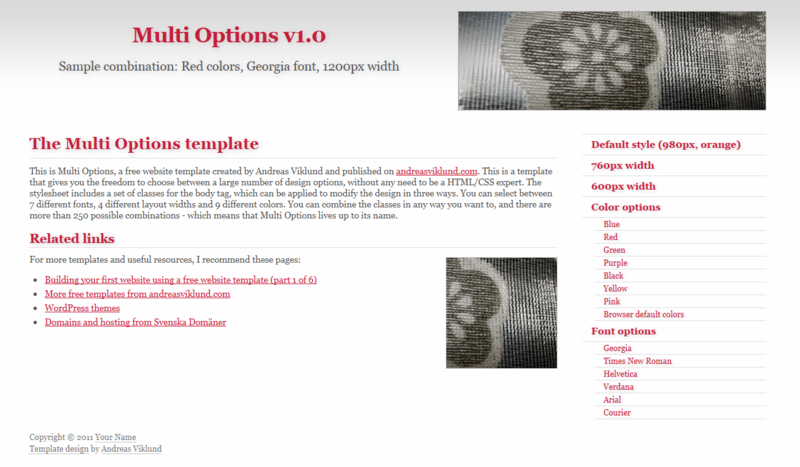 The latest free template release, Multi Options, allows template users to combine a set of options into hundreds of different designs. In order to help you get started with the template, here is a quick tutorial on how the options work. These classes changes the layout width to 600, 760 or 1200 pixels. All fonts are common web-safe fonts that should work with all browsers on all operating systems. If, for any reason, a font would not work, there is a fallback cal to the default serif/sans-serif/monospace of the viewer. Adding your own styles is not difficult. Look at the CSS file to see how the included classes are written. You can adjust any of the existing colors by modifying one single value (in hexadecimal). For example, to make the blue color darker, scroll down to the .blue classes and edit the default blue color (#467aa7) to #2a5a9a and then save the CSS file. If you use body class=”blue”, you will now get a dark blue color instead of the lighter blue that I added. I hope that this will give you some inspiration to play with the body classes and find your own combination among the styles that the Multi Options template includes. If you are missing something specific or need help, post a comment here or in the support forum and I will do my best to help you. Thanks for your article. Could you please answer the question if it is possible to change somehow with the help of classes the constant color to the background image I prepared for my template? After such good tutorial even me ( php noob ) can modify this template. Found the tutor little tricky. First of all it stunned me with the effect of simple change of layout, but in the end it fails by having multiple .html files with different names though. Then I came into idea that jQuery for example could easily take this behaviour of links to change layout. But nice idea though. This is what I got from this tutorial. a bit of advice needed really about the way web pages are linked together. From what I can see it isn’t covered in your tutorials. In the multi options v1.0, which is the one I have been playing about with. If I wanted, say 5 other pages on the website. From the homepage I would have to make 5 links to those other pages. If I clicked on say page 3 button/link from the homepage, then on the page 3 html I would have to make links to pages 1 2 4 5 & the homepage (is this correct?). Or is there a simple way of doing this. The reason I ask is because, If I had a website with 100 pages, it would take a whopping amount of time ! One other question, what is the difference between the index.html & the homepage.html are they the same thing ? PS, I am determined to get a website up and running very soon. I hope with your expert advice I may just do it. We’re on the project to create “news portal” css templates. This post are very helpful for us. How easy is it to have the options column on the left and the body on the right?